They help to conserve water. Once established, they do not need any watering beyond what nature provides! They attract wildlife. Get a bird's-eye view of the birds and critters right in your backyard. They are virtually maintenance-free. No fertilizers, no pesticides, no special care. P.I.E. Environmental sponsors educational programs that help to inform Islanders about local landscaping. P.I.E. Environmental developed demonstration gardens in public spaces around the Island in cooperation with Islandscapers to enhance the natural beauty of the island, reflecting "best stewardship practices" for our fragile barrier island environment. Two Demonstration Gardens were created in 2006 at Station 10 (the Island firehouse). The garden on the south side, known as PIE Native Plant Restoration, was designed to be totally native. On north side of the Firehouse Islandscapers created a Florida Friendly Garden using both native and island friendly plants and a butterfly garden. Before planting, trees were trimmed, weeds were pulled and invasive species were removed. Services and materials were donated, such as a wood chipper (Dean Beckstead) to mulch on-site, piling ends (Anna & Rick Stokes) that were used to define entrance, exit and specific planting areas and lattice trellis (Islander Builders, Southern Design) for the vines in the Butterfly Garden. 1) The Native Plant Restoration Garden - native trees, shrubs, grasses, wild flowers, and vines support native wildlife. 2) The Butterfly Garden - bushes and flowers to attract birds and butterflies. 3) The Florida Friendly Garden - salt and drought-tolerant plants to provide variety and color, but also with wildlife value. P.I.E. Environmental maintains the the Native Plant garden and Islandscapers maintains the Florida Friendly and Butterfly gardens at the Firehouse. On Earth Day, April 21st, 2006, P.I.E. Environmental and Islandscapers sponsored a celebration and tour of the new Demonstration Gardens. Over 50 Island residents attended and enjoyed good information, great food and drink and the opportunity to celebrate this beautiful Island. The Native Plant Garden at the ferry landing was created by PIE Environmental around existing palm trees in the Charlotte County right of way. 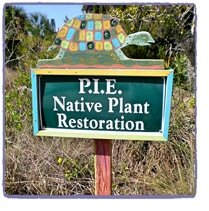 In 2008, PIE received a Charlotte Harbor National Estuary Program Micro Grant to purchase native plants for the demonstration garden and create a beautiful introduction to the island. When P.I.E. purchased a gazebo for the ferry landing, P.I.E. Environmental and Islandscapers launched a beautification project to provide plantings around the new Island Gazebo. In 2011, unsightly utility boxes were screen with paintings and native and island-friendly plantings. P.I.E. Environmental and Islandscapers continue to work together to maintain all of these gardens, with annual clean-ups incorporated into the annual Beach Access Clean-up and Cookout in the Fall. P.I.E Environmental has two volunteers who hold Florida Master Gardener certification, and they are available to assist fellow Islanders with environmentally-friendly landscaping.